Paul Harvey told about a 3-year-old boy who went to the grocery store with his mother. Before they entered the grocery store she said to him, “Now you’re not going to get any chocolate chip cookies, so don’t even ask.” She put him up in the cart & he sat in the little child’s seat while she wheeled down the aisles. He was doing just fine until they came to the cookie section. He saw the chocolate chip cookies & he stood up in the seat & said, “Mom, can I have some chocolate chip cookies?” She said, “I told you not even to ask. You’re not going to get any at all.” So he sat back down. Finally, they were approaching the checkout lane. The little boy sensed that this may be his last chance. So just before they got to the line, he stood up on the seat of the cart & shouted in his loudest voice, “In the name of Jesus, may I have some chocolate chip cookies?” And everybody round about just laughed. Some even applauded. And, according to Paul Harvey, due to the generosity of the other shoppers, the little boy & his mother left with 23 boxes of chocolate chip cookies. 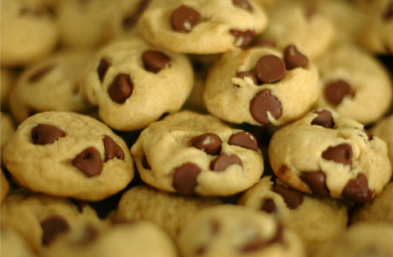 In this note, we are going to discover all the boxes of chocolate chip cookies God gives us through His Son, Jesus Christ! 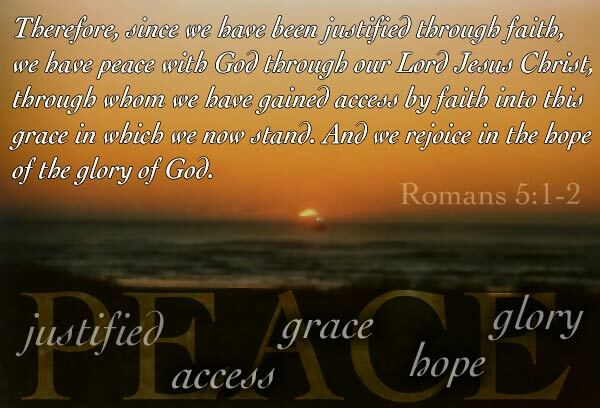 “Since then it is by faith that we are justified, let us grasp the fact that we have peace with God through our Lord Jesus Christ. Through him we have confidently entered into this new relationship of grace, and here we take our stand, in happy certainty of the glorious things he has for us in the future. This doesn’t mean, of course, that we have only a hope of future joys – we can be full of joy here and now even in our trials and troubles. Taken in the right spirit these very things will give us patient endurance; this in turn will develop a mature character, and a character of this sort produces a steady hope, a hope that will never disappoint us. Already we have some experience of the love of God flooding through our hearts by the Holy Spirit given to us. And we can see that it was while we were powerless to help ourselves that Christ died for sinful men. In human experience it is a rare thing for one man to give his life for another, even if the latter be a good man, though there have been a few who have had the courage to do it. Yet the proof of God’s amazing love is this: that it was while we were sinners that Christ died for us. Moreover, if he did that for us while we were sinners, now that we are men justified by the shedding of his blood, what reason have we to fear the wrath of God? 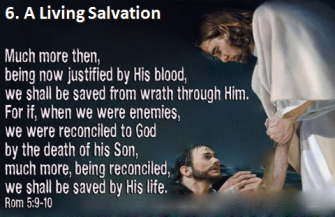 If, while we were his enemies, Christ reconciled us to God by dying for us, surely now that we are reconciled we may be perfectly certain of our salvation through his living in us. Nor, I am sure, is this a matter of bare salvation – we may hold our heads high in the light of God’s love because of the reconciliation which Christ has made. 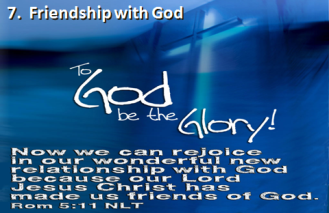 We have a WONDERFUL NEW RELATIONSHIP with God through Jesus! Martin Luther wrote…In the whole Bible there is hardly another chapter which can equal this triumphant text! 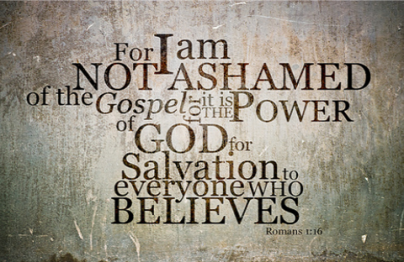 The gospel of Jesus Christ is the means of our DAILY salvation, whereby the righteousness of God becomes our righteousness! Paul began Romans with the Power of God on display, the power to bring sinful man into a right and righteous relationship with God! Romans 5 reveals that this is all TROUGH Jesus Christ and how marvelous the benefits of that Right Relationship are! The result of Chapter 5 is that God now puts His Children of Faith on Display! The word “therefore” reaches back to the contents of chapter four — therefore being justified (made righteous-the righteousness of God), not by works (1-8), not by rituals (9-12), not by obedience to the law (13-25), but by faith (our belief in the truth of God), we have peace. Your works, your rituals, even your following the law will never bring peace to your heart and soul. 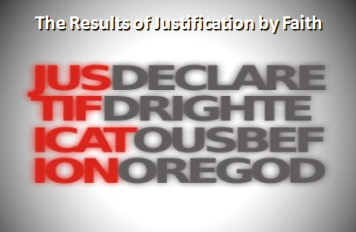 All that follows from the 5th chapter, 1st verse to the end of the 8th chapter describes the fruit or results of justification, the inheritance of those who are justified. Having been justified by faith, that which Paul now discusses, chapters 6, 7 and 8, shall be true of us. We must fully understand and envision what Christ has done for us if we are to live the Christian life that Paul will detail in Romans 6,7 and 8! 1. A legal declaration of righteousness. It isn’t that a sinner is merely made to ‘feel’ righteous in a subjective way. Rather, God “declares” the sinner to be objectively righteous in a forensic or judicial sense — regardless of his or her feelings. He doesn’t simply “cover up” the sinner with the righteousness of Jesus in such a way as to conceal his or her real condition of sinfulness from His eyes — as though simply covering him or her with a “righteousness” coating. 3. An imputation of righteousness. To “impute” something means to ‘attribute’ it or ‘credit’ it to something or someone else. If, for example, I had a ‘zero’ balance in my checking account, I would draw some money out of my savings account and have it “imputed” or “credited” or “attributed” to my checking account. The only way that the checking account could have cash value is if it is “imputed” into it from another account. When God justifies a sinner, he or she is not made “righteous” on the basis of anything that they do — nor on the basis of anything God enables them to do. God completely “imputes” genuine righteousness to them — “attributing” it to them, or “crediting” it to their account. 4. A righteousness through faith as opposed to works. Sinners are not “justified” on the basis of their faith — or on the basis of any other work they could do, for that matter. They’re declared righteous before God on the basis of two things: that their sins were placed onto Jesus when He died on the cross; and that His perfect obedience and righteousness imputed to them — He became sin for them (and died in their place); and they became the righteousness of God in Him. Faith is the means by which the sinner comes into possession of that imputed righteousness. A sign in front of a church said, “If life is a puzzle, look here for the missing peace” and spelled that last word p-e-a-c-e! 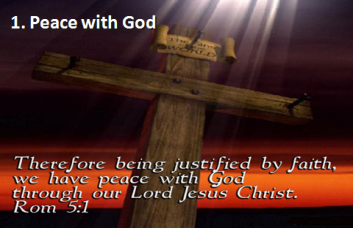 ἔχωμεν- let us have (Word Studies)= let us grasp the fact that we have peace with God through our Lord Jesus Christ. Peace (eirene from verb eiro = to join or bind together that which has been separated) literally pictures the binding or joining together again of that which had been separated or divided and thus setting at one again, a meaning convey by the common expression of one “having it all together”. “For he is our peace, who hath made both one, and hath broken down the middle wall of partition between us; having abolished in his flesh the enmity, even the law of commandments contained in ordinances; for to make in himself of twain one new man, so making peace” (Ephes. 2:14-15). “And, having made peace through the blood of his cross, by him to reconcile all things unto himself; by him, I say, whether they be things in earth, or things in heaven” (Col. 1:20). harmonized relationship between God and man (Vine’s). It can refer to one’s “introduction” into a relationship or it can refer to “ongoing access” in an existing relationship. Paul’s use of the same term in Ephesians 2:18; 3:12 seems to suggest that what is in view in Romans 5:2 is continued access to God, and not so much on the initial introduction into the relationship. He hasn’t merely reconciled us to Himself and then left it up to us to keep ourselves in that state. He has placed us “in Christ”; and in Him, we have been made “the righteousness of God” And being in that state of righteousness, it’s only by His grace that we stay that way! 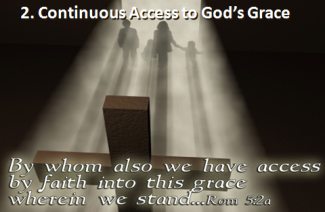 Through Jesus Christ His Son, we “have obtained (place of continuous access to God). We are not left to ourselves to keep from wandering in and out of God’s favor all the time. We’ve been introduced to a state of favor before Him through Christ; and in Christ, it’s in this state of favor that, by being in Christ, we forever “stand”! Paul wrote to the Galatian church about this very issue. The Christians in Galatia were fearful that, even though they were brought into God’s favor by His grace, they needed to keep the old Jewish ceremonies of the Old Testament in order to stay in God’s favor. Paul wrote to them very strongly and urged them not to place themselves under those rules and ceremonies. “Are you so foolish?”, he asked them; “Having begun by the Spirit, are you now being perfected by the flesh?” (Gal. 3:3). “It was for freedom that Christ set you free,” he reminded them; “therefore keep standing firm and do not be subject again to a yoke of slavery” (5:1). 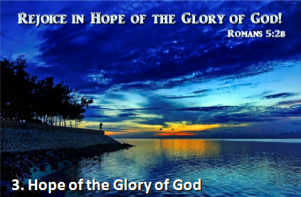 Romans 5:2b (KJV) …and rejoice in hope of the glory of God. We have a Whole New Outlook. Those whom God has justified will also be glorified! Tribulation = word that means to “squeeze” or “press” something; Picture of pressing circumstances or distressing hardships. “It describes distress that is brought on by outward circumstances.” Look at the way God uses the “pressure times” in the life of someone that He has declared “righteous” before Him. 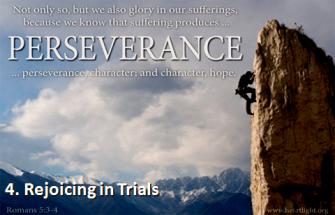 A. Tribulations produce “perseverance” or “patient endurance”. They produce the quality of learning to trust in God and wait upon Him, relying upon His strength in the knowledge that He has nothing in mind for us but our good. Tribulation is a thorny tree, but it yields sweet fruit. A guitar string only fulfills its purpose when it is removed from its old package, stretched as tight as it will go, & then plucked! When a storm comes at sea, a ship turns to face the tempest. If the vessel allows the storm to hit its side, it will capsize. If it turns its back to the storm, the storm will drive it wherever the wind blows. Only in facing the storm is the ship safe. God is not punishing us. All our punishment has already gone onto Christ, and He took our punishment for us. And what’s more, His righteousness before God was placed to our account. We are Justified with God, so there’s nothing left to think about our troubles and trials but as things that our sovereign God permits to come upon us in order to make us grow into the glorious image of Christ that He has predestined us “in Him” to be. The difficult times of life don’t make us into anything different — they just show us to be what we really are. If someone comes out of their trials a bitter person, it’s because, deep within, they were already bitter in the first place — and the circumstance simply proved their true character. If someone comes out of their trials with a sense of confidence in God, giving praise to Him for what He has done, it’s because God developed perseverance in them through the exercise of their faith in Him — and the circumstance simply proved their true character. 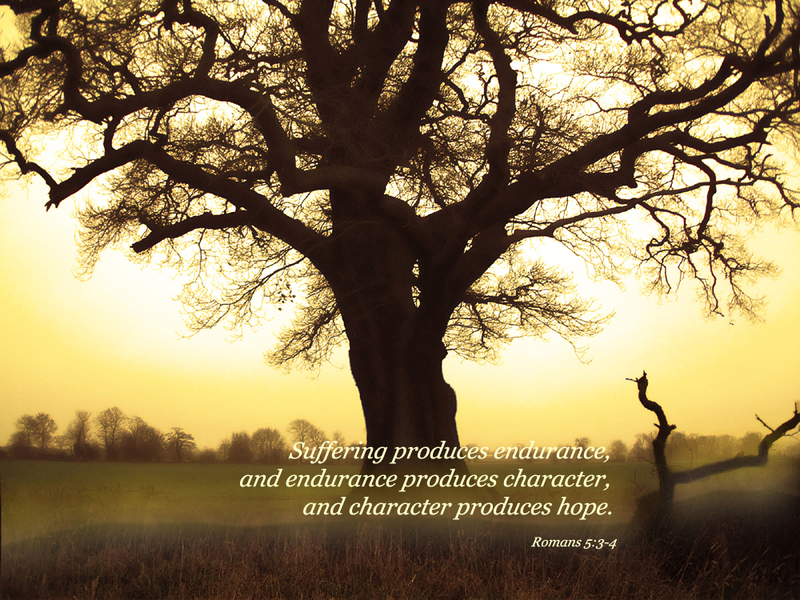 C. Proven character produces “hope”. Confident Anticipation that it will be worth it all! It’s a hope that already has a guarantee of victory to it because He already loves us! All this, because He has declared us righteous in Christ!! The present in no way jeopardizes the future (5:5). Paul’s emphasis here is that in light of justification and the indwelling Spirit, God can actually use our difficult experiences in life to work a deeper hope in us—i.e., a deeper longing for him and desire to experience him. 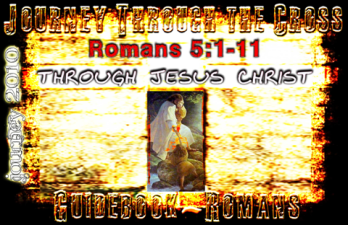 Romans 5:5b-8 (KJV) 5 … the love of God is shed abroad in our hearts by the Holy Ghost which is given unto us. 6 For when we were yet without strength, in due time Christ died for the ungodly. 7 For scarcely for a righteous man will one die: yet peradventure for a good man some would even dare to die. 8 But God commendeth his love toward us, in that, while we were yet sinners, Christ died for us. “O righteous Father, although the world has not known You, yet I have known You; and these have known that you sent Me; and I have made Your name known to them, and will make it known, so that the love with which You loved Me may be in them, and I in them” (17:25-26). In fact, Jesus even prayed that the extent of God’s great love for us would become clearly known; “… that the world may know,” He prayed, “that You sent Me, and loved them, even as You have loved Me” (John 17:23). How can we help but gasp when we read that — that the Father loves us as much as He loves His own Son Jesus!! Hope always burns brightly in those whose character has been developed through overcoming trials. Paul is not talking about the objective love of God shown to us in the cross (3:25; 5:8), but rather the subjective apprehension (i.e., in our hearts) of God’s love. For Paul this is primarily an emotional experience with a force greater than the doubt inflicted through trials (cf. Phil 4:6-7). Hope is not the tuition we pay as we enroll in the school of adversity. Rather, it is the diploma awarded to those who by the grace of God do well on the tests. 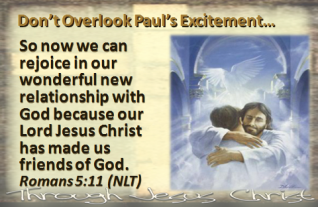 How do we experience this great love as displayed by Jesus? We experience it as the Holy Spirit makes it known in our hearts. He literally “shed’ the love of God into our lives. As we place our faith in the blood of Jesus, the Love of God flows into our hearts and lives.! 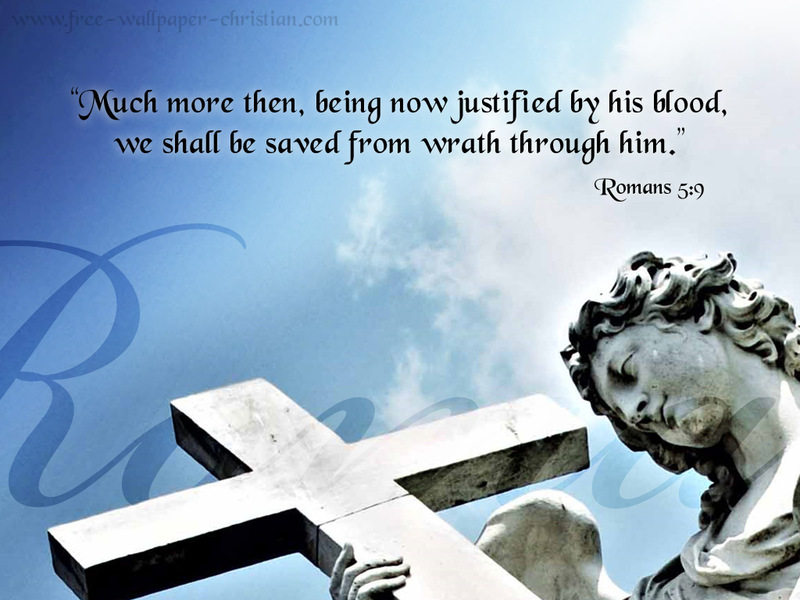 Romans 5:9-10 (KJV) 9 Much more then, being now justified by his blood, we shall be saved from wrath through him. 10 For if, when we were enemies, we were reconciled to God by the death of his Son, much more, being reconciled, we shall be saved by his life. If He so loved us when we were still sinners — which is the far greater thing; then now that we’ve been declared righteous by Him out of His love for us, He will surely spare us from His wrath against sin — which is the lessor thing. Just as God is gracious and ready to forgive, He is also just and is fully prepared to pour out His wrath on sinners that will not receive His merciful offer, but who continue to defiantly rebel against Him. He declares His own character to Moses in this way: “The LORD, the LORD God, compassionate and gracious, slow to anger, and abounding in lovingkindness and truth; who keeps lovingkindness for thousands, who forgives iniquity, transgression and sin; yet He will by no means leave the guilty upunished, visiting the iniquity of fathers on the children and on the grandchildren to the third and fourth generations” (Exodus 34:6-7). This gives us cause to stop and remember that while He is always and ever ready to forgive any sinner that cries out to Him, “God, be merciful to me, the sinner!”; He still remains a holy God and will not put up with sin. To those who will not turn from their sins and receive His gracious offer of “justification by faith”, there remains this warning of His wrath. Romans 5:11 (KJV) And not only so, but we also joy in God through our Lord Jesus Christ, by whom we have now received the atonement. “But you are a chosen race, a royal priesthood, a holy nation, a people for God’s own possession, so that you may proclaim the excellencies of Him who has called you out of darkness into His marvelous light; for once you were not a people, but now you are the people of God; you had not received mercy, but now you have received mercy” (1 Peter 2:9-10). C. Our New Life in our Living Savior allows us to enjoy the experience of ever-satisfying, ever-thrilling, ever-expanding fellowship with Him for all eternity. John 10:10 (ESV) The thief comes only to steal and kill and destroy. I came that they may have life and have it abundantly. 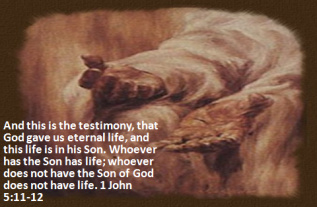 John 17:3 (ESV) And this is eternal life, that they know you the only true God, and Jesus Christ whom you have sent. John 15:14-15 (ESV) 14 You are my friends if you do what I command you. 15 No longer do I call you servants, for the servant does not know what his master is doing; but I have called you friends, for all that I have heard from my Father I have made known to you. Glorification, the consummation of the Christian experience. Edgar Allen Poe wrote a horrifying story set in a dungeon during the Spanish Inquisition.He takes us beneath a castle into a horrible dark, rat-infested dungeon. There we find an unnamed man who has been tried and found guilty.The stench of death and human feces is overpowering. He can hear tha rats scampering all around him. He tries to search the dungeon to see if there is a way of escape, but it’s too dark. He stumbles around and nearly falls into a huge pit in the center of the cell. He is knocked unconscious. When he wakes up, he realizes that he is strapped into a torture device that houses a swinging, razor-sharp pendulum. The pendulum gradually lowers closer and closer to his heart. The man goes mad as he watches the pendulum grow near. He uses his free hand to wipe the remains of his last meal onto the strap that sits between his body and the pendulum. This attracts the rats, and they chew through the strap, freeing him. As soon as he stands, the pendulum is raised and the iron walls— which have been heated to a dangerous level—close in on him. The hero is forced closer to the pit’s opening. Just before he falls, General Lasalle’s French army arrives and rescues him. Our enemy Satan has thrown mankind into a dark miserable dungeon of sin. He makes us godless, senseless, faithless, heartless, ruthless, worthless and powerless. He binds us with our sins, he tortures us, and he is constantly pushing us into the pit of his Hell. God has given us so much, so that we can have so much! 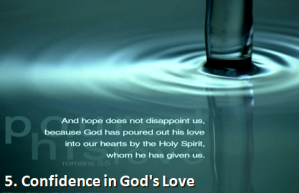 Confidence in God’s Love for us. Are you content to hear the swooshing of the pendulum blade as it inches closer and closer to your heart? 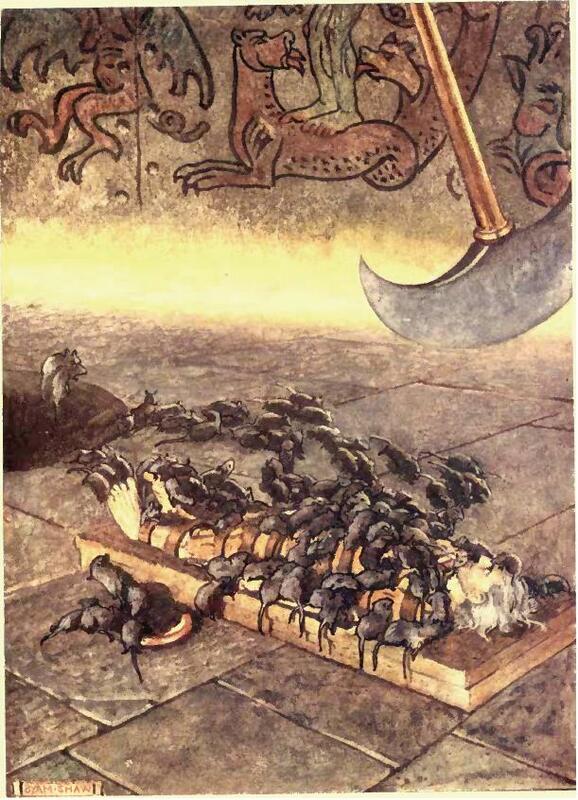 Do you enjoy the rats of sin? Do you enjoy the stench of death and decay? God wants you to enjoy Him, to enjoy His Love, His peace, His grace, His friendship. And it is all freely given to you through His Son, Jesus Christ! It is all yours by believing in God’s Word! Believe God, and it will be counted to you as Righteousness! All Aboard the USS Faith!